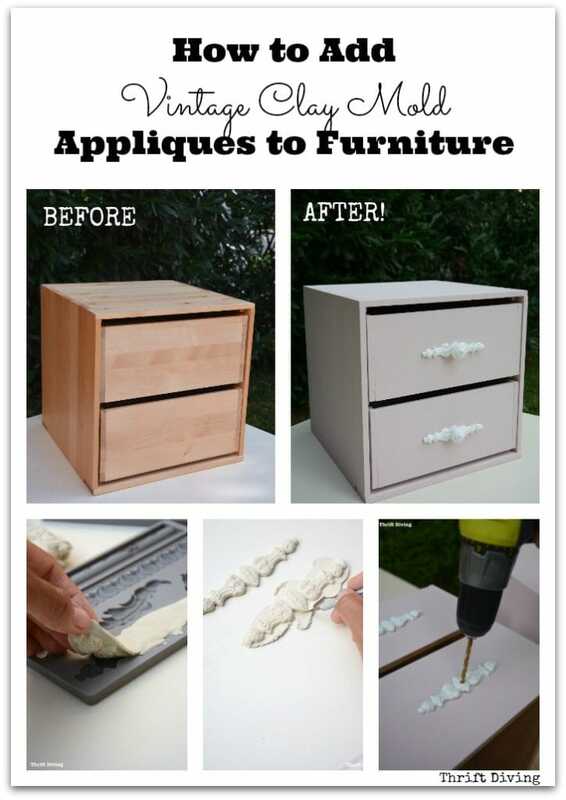 I’ll admit–I was a little nervous about using these DIY furniture appliques. You know how it is…any time there’s a new product you’ve never used before, there’s always some amount of hesitation, right? You’re worried you’ll look like a DIY idiot and not be able to figure it out. But I knew that this little thrifted IKEA box I found recently for about $6.00 was the perfect project to practice my new vintage clay mold applique skills! (Psst! 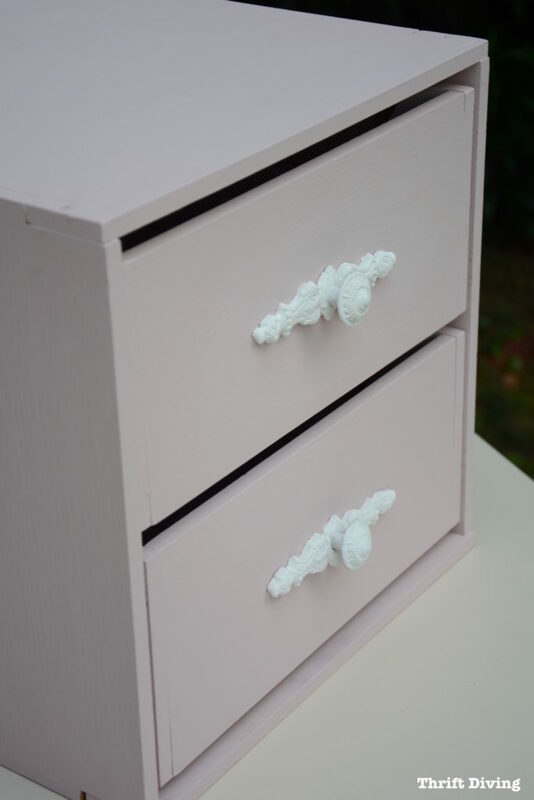 If you love this tutorial on how to make furniture appliques with clay molds, be sure to check out 3 more ways to glam up your painted furniture with scrapbook paper, Rub ‘n Buff, and furniture paint! Aren’t the clay furniture appliques so cute?! 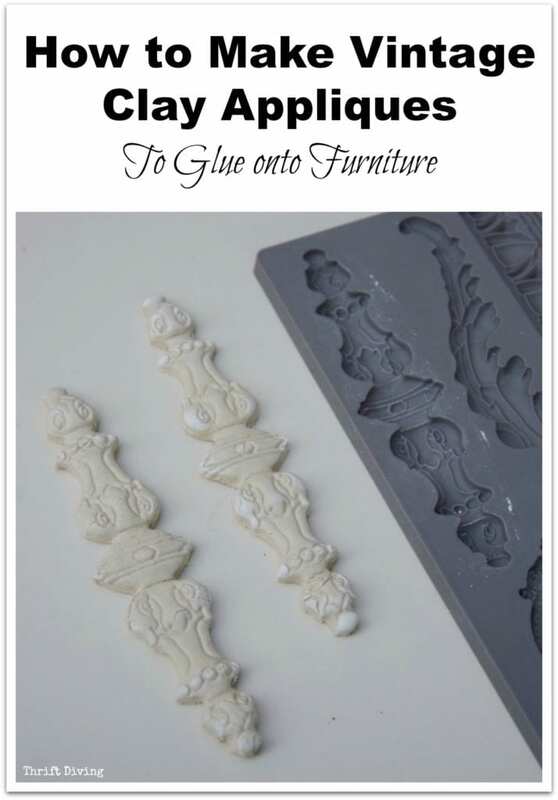 Let me show you exactly how I created these furniture applique molds! 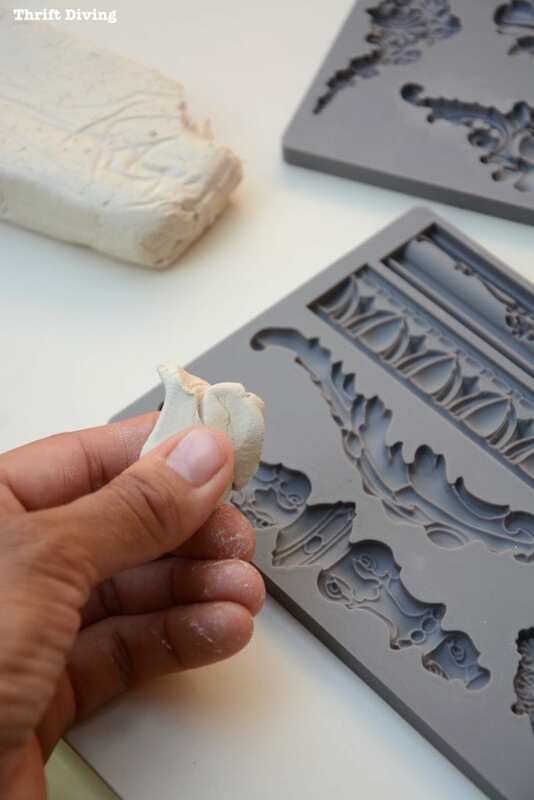 Where to Buy Clay Molds? 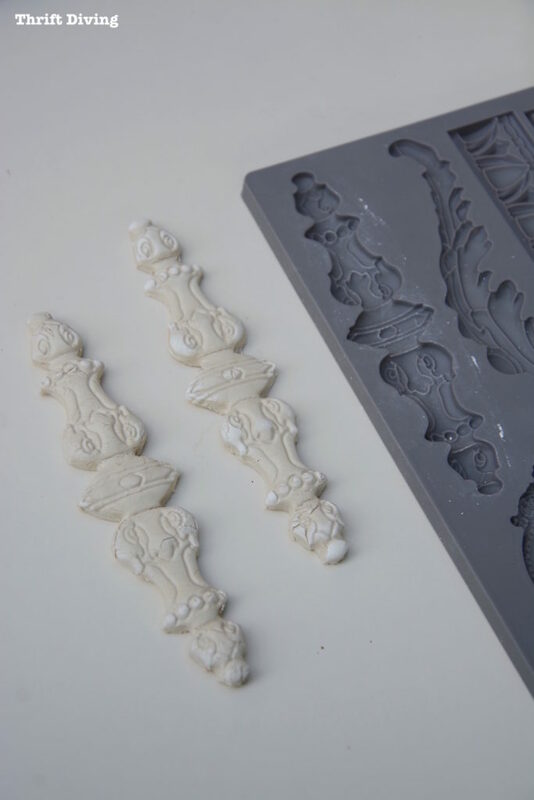 The furniture applique clay molds are food-grade, so you can buy one set for clay appliques for your furniture, and buy another set for making chocolate molds. HA! They actually say on their website that you can use them for chocolate, fondant, sugar paste, polymer clay, paper clay, paper machete. 🙂 Don’t you love that versatility?? You’ll need a bar of their paper clay. This isn’t the same clay your kids or grandkids play with. 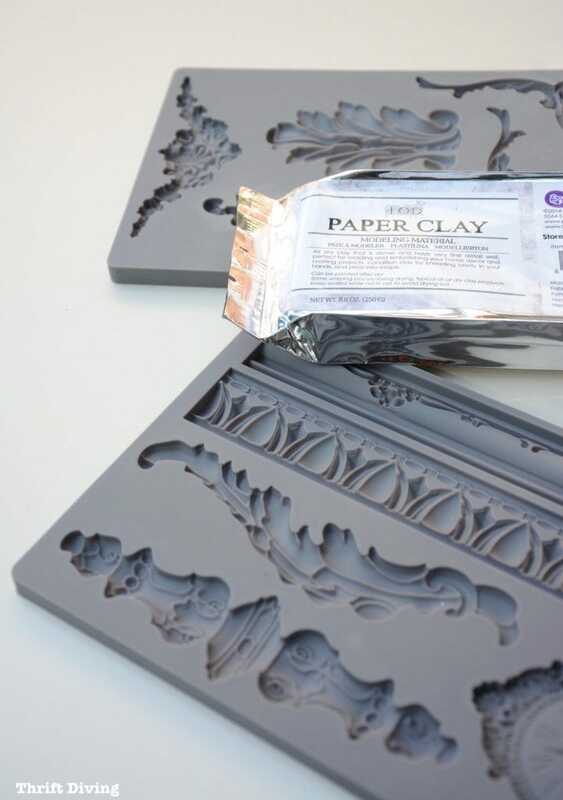 This is the clay that the artists use–perfect for molds! STEP 2: Press and Pull! What I like about using these is that it’s something you can do right from your kitchen table. And because they’re easy to make, you can do a bunch of them at a time. All you do is push the clay into the mold, making sure it’s even and flat. You can use a knife to cut away any excess and to smooth it out. I just lumped it in there and waited until afterward to cut away the excess. As soon as you’ve got in there firmly, remove it immediately. Especially if you’re making a lot, this will allow you to make a bunch in a short period of time. STEP 3: Get Rid of the Excess Clay! 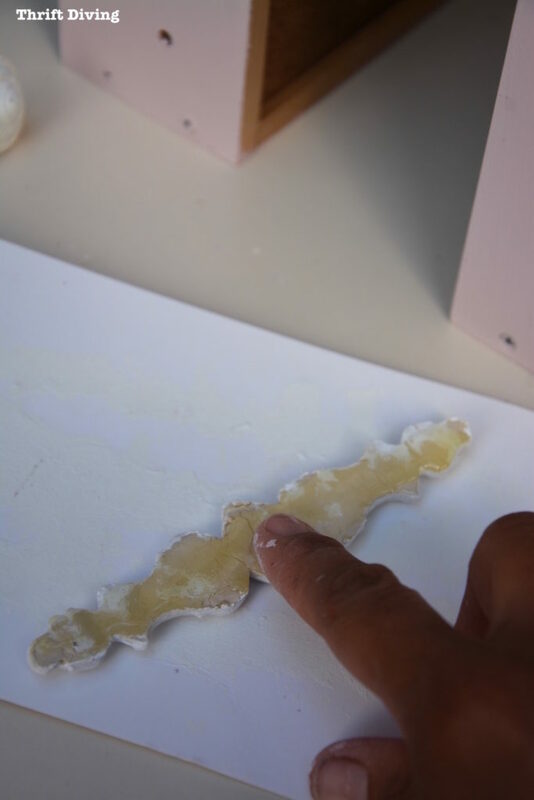 As I mentioned above, it’s probably easier to remove as much of the excess that you can before pulling out the mold, especially on the back, otherwise, your mold may not lie flat if you have a hunk of clay bulging up. I did it the opposite way and left some of the extra clay so that it was easier to pull out. Then I used an X-Acto knife to remove it. But next time, I’d recommend scraping some of the clay away first. Once all the excess is removed, they should look similar to this (but probably better if you knead the clay longer than I did!). STEP 4: Paint the Clay! ….or stain them, or whatever you want to do to them. They don’t have to be totally dry. 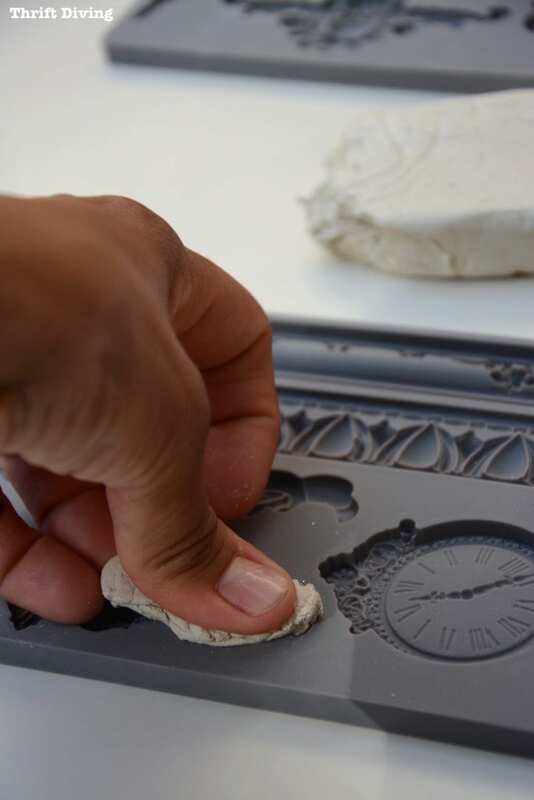 In fact, you want to move quickly on decorating them and adding them to your project because once they dry, they’re more likely to crack. So decorate them now! Dark wax or stain looks really good on them because they have so many details! 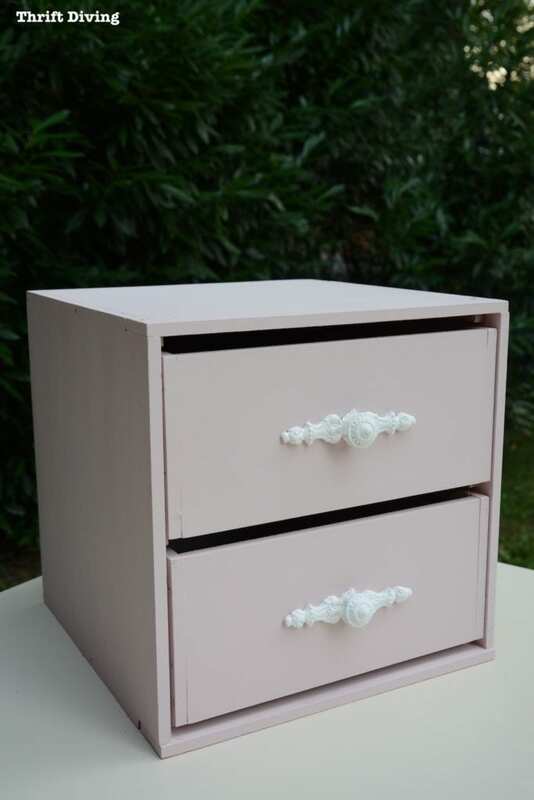 For mine, though, I just went with white chalk paint. 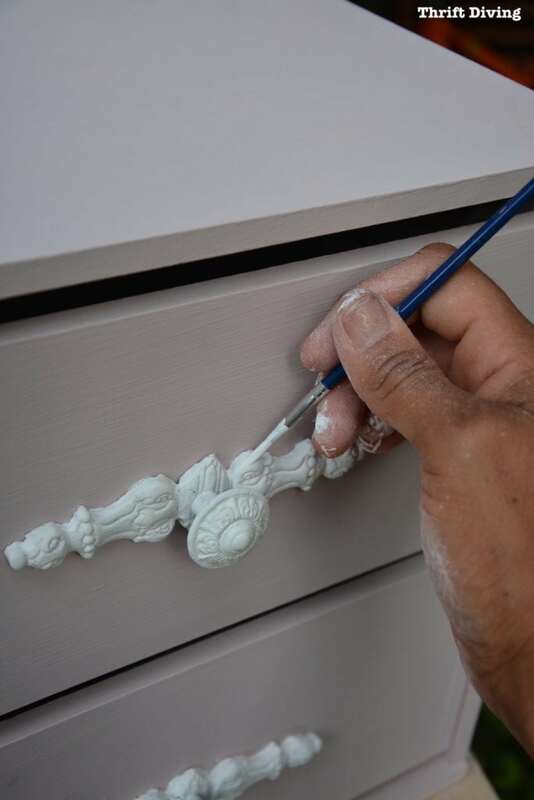 KEEP READING: What’s the Best Paint For Furniture? If you’ve already got knob holes, yay! 🙂 But for this plain piece, I had to create them, which is simple. I could do it while the paint was drying on the clay furniture appliques. I used my empire square (highly recommend this useful tool!) and found the center of the drawers, marked, and drilled. 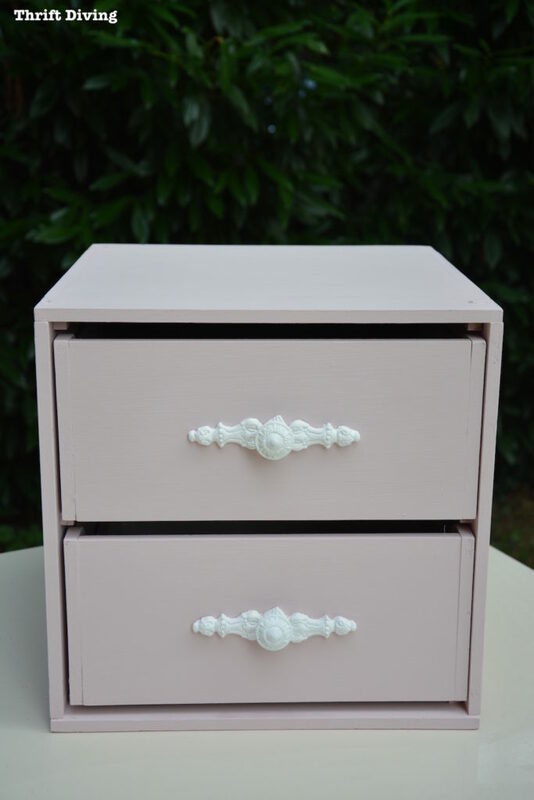 Once everything has been drilled, I used a chalk paint (Annie Sloan chalk paint in Antoinette) in a soft pink. I absolutely love this color, especially with Pure White! STEP 6: Apply Furniture Appliques! Now for the really fun part: applying the furniture appliques to your project! At this point, the clay furniture applique should still be drying. You don’t want to wait until the appliques are dry because they’ll twist and warp and all kinds of yoga. LOL. 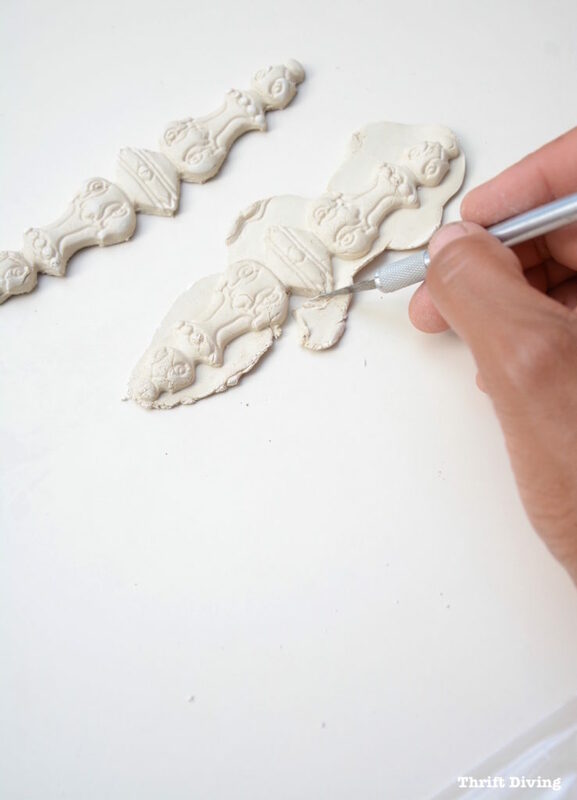 While they’re still damp, before the clay dries, is the best time to apply the appliques with wood glue. The wood glue will hold them into position while the clay is drying. 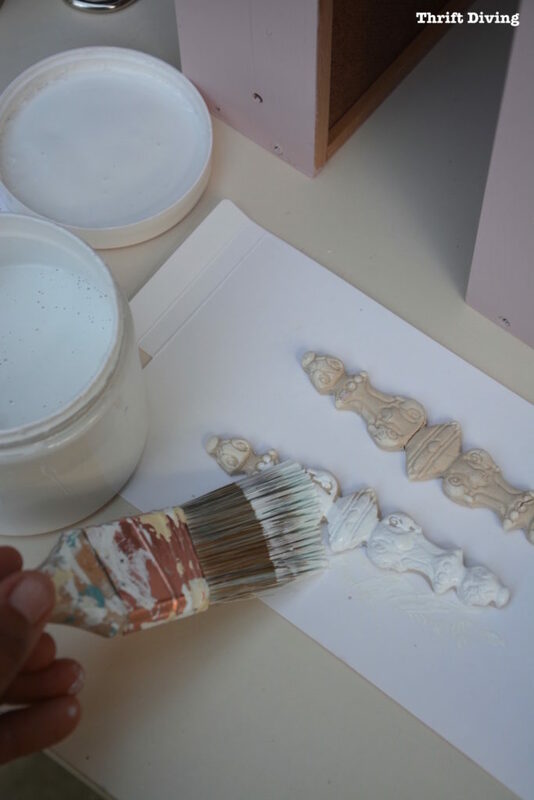 TIP: You can use a blow dryer on cool to help the paint dry if you’re anxious to get the furniture appliques glued down before they dry! 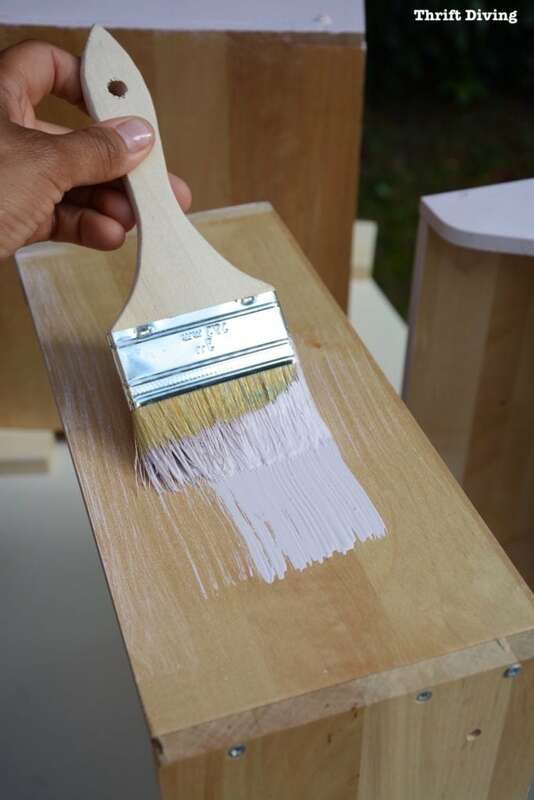 The best glue to use when making cheap furniture appliques like this is wood glue. That stuff is super tough and will hold it into place very well. 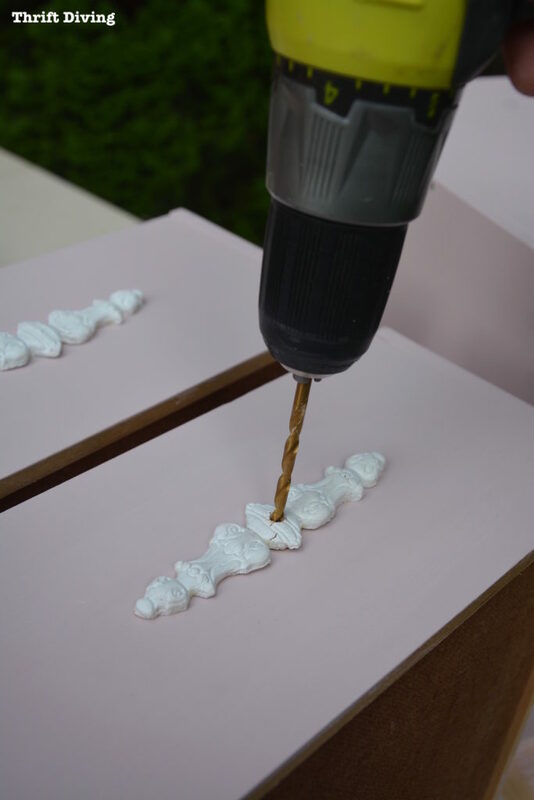 STEP 7: Drill Through Your Clay Furniture Appliques! Another reason I apply the clay appliques on my project quickly is that I knew I’d have to drill through them. Don’t try this while they’re dry or they’re sure to crack, my friend! Just line up the center of the mold with the hold you’ve just drilled. 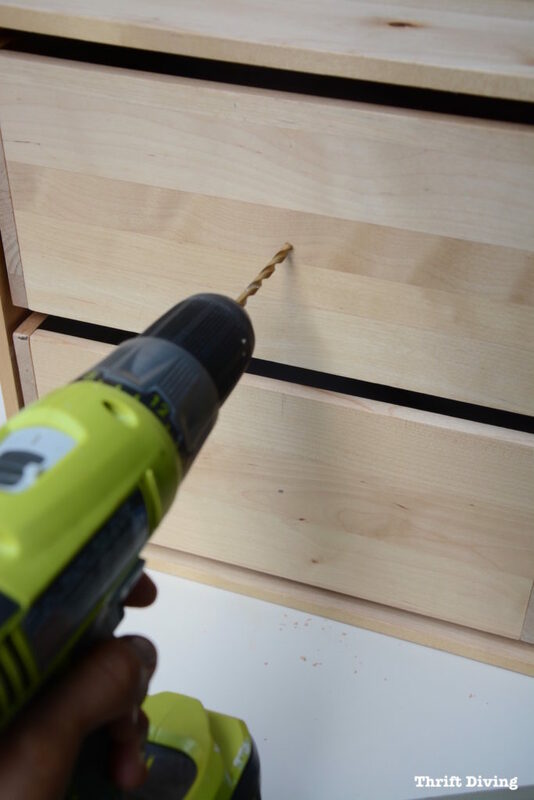 Use the drill bit that’s for the knob you’re using (meaning, the skinnier the furniture applique, the skinnier your drill bit should be, etc). I just used a practice board first and tried out a couple drill bits to see which one was the right size. 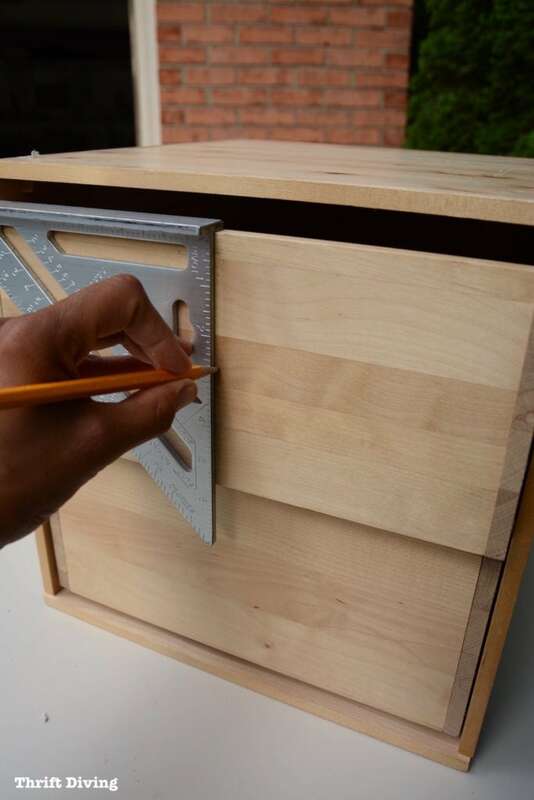 Get into the habit of practicing on scrap boards before doing things on your “real” project. Believe me–it saves you a bunch of time and money! Once you’re done drilling, add the knobs. I re-used some old knobs I had removed from another project a long time ago. Trust me–it’s not going to look perfect. I guarantee they will be some small spots to touch up. That’s where the small paintbrush comes in! 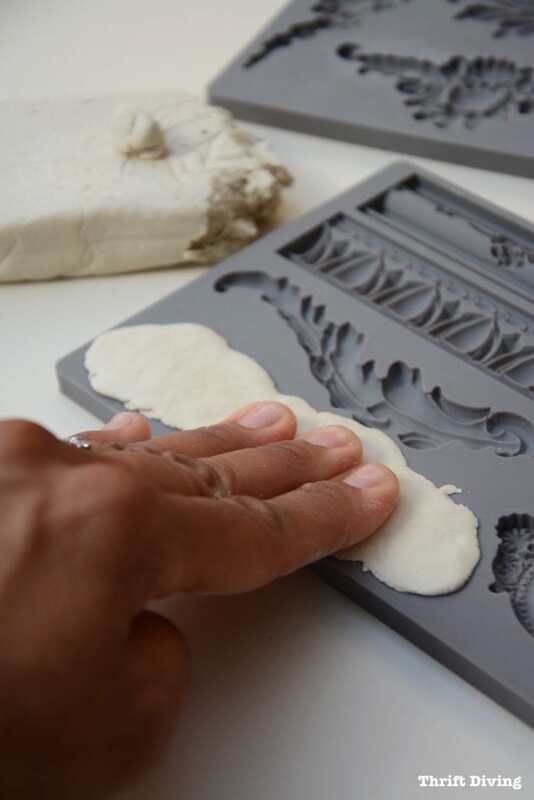 Furniture Appliques from Clay Molds Are Awesome! 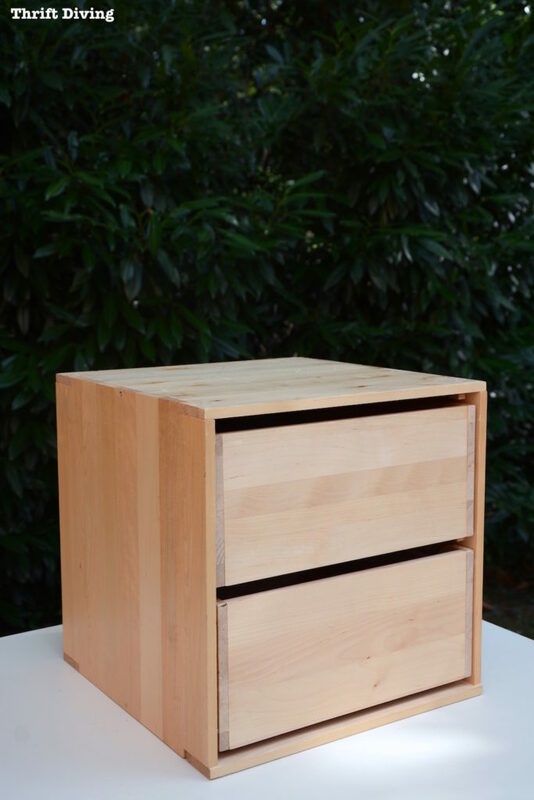 I can’t believe how boring this IKEA 2-drawer table-top cabinet is! Here’s another shot of the boring “BEFORE” picture! Loving this project? 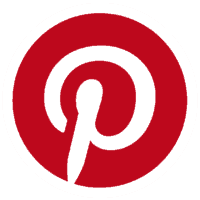 Click here to SAVE it to Pinterest! I wanted to get super crafty and add some legs to this piece to make it like a little side table, but that will be the next step, for another post. Or I’ll just add it to my pretty basement office to organize my papers! 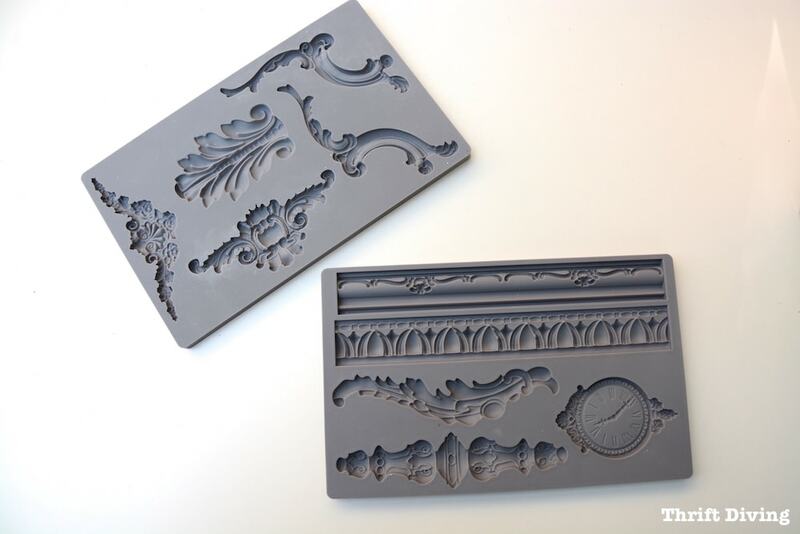 For now, I’m loving these silicone furniture appliques made from clay molds! I’m just thinking of all the ways I can use them! 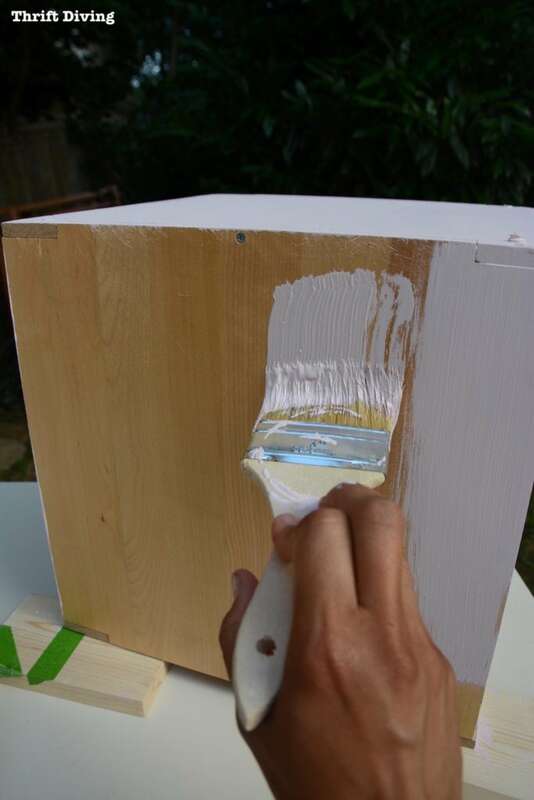 Furniture makeovers are boring with just paint. It’s the small details that really make them interesting! Serena, this is the answer to something that’s been puzzling me for over a year! I cannot wait to try it. I don’t get to read all of your blogs or comment on all that I read, but I do enjoy them when I can. Your steps are so easy to follow. Or would be, if I followed them. LOL!!! And believe me, I’ll share when I do get around to using your ideas! Thank you for sharing. Love what you do. Same to you! I love decorating the table–Jingle Jingle now!!! Estou interessada nos moldes em arabescos e rosas !, como posso velos? E quanto custam cada modelo como funciona? Sou brasileira e só falo português! Last night along with the clay and some gold rub n buff. 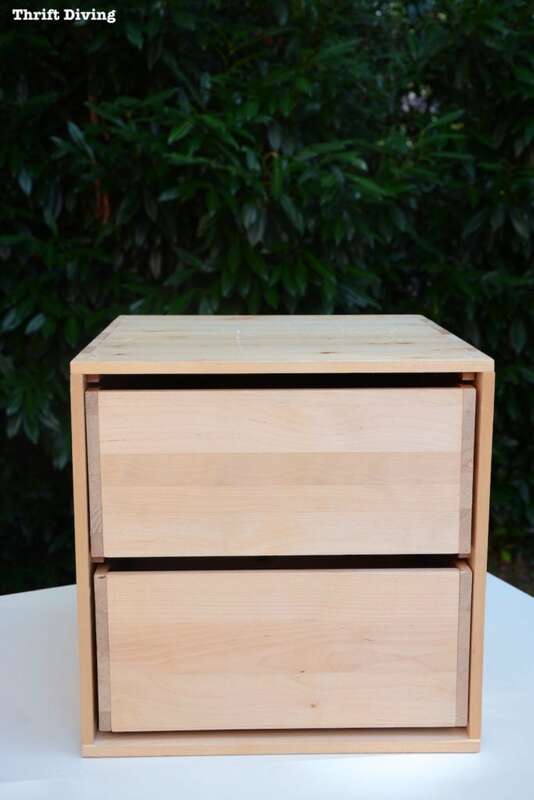 Can I attach with wood glue without using knobs? The area I am attaching doesn’t need knobs and I wanted to make sure just using the glue would suffice. I will probably add the molds somwtime tomorrow- I need to grab the wood glue. I wish I could attach a photo for you! So glad you did this! I’ve been looking at premade wood pieces to pretty up the main post on my staircase. They are expensive! This is a perfect redo for me! Thank you! Hi Serena, I’m Anne, and I’m visiting from the DIYParty blog hop. 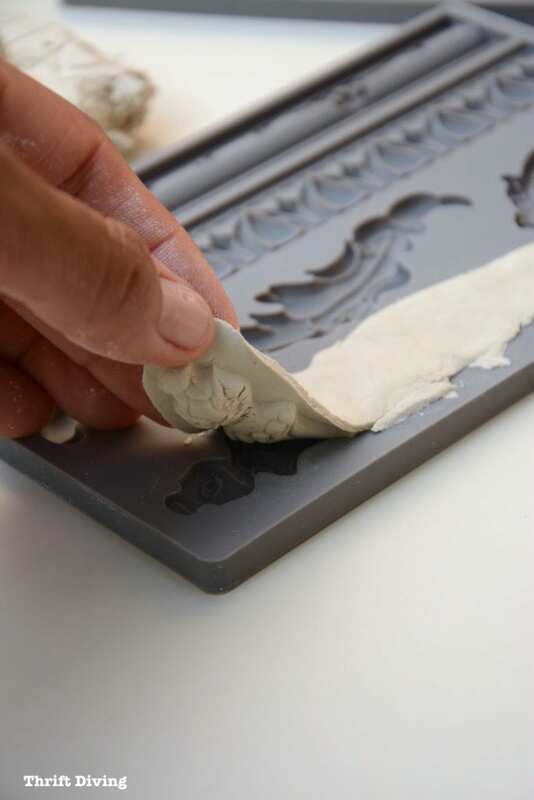 Thanks for sharing the idea and all the steps for your clay mold appliqué projects. I had never of that before, but I might try it! Anyway, have a wonderful day, and I hope you can pop over to my blog (https://birdsongbitsandpieces.blogspot.com) sometime to say hi! What a great idea. I’ve never heard of these before. I definitely need to add one of these to my desk… right now it has a little piece that just looks like a mustache.